Development of New Theory, which may be useful to operations research practitioners, or which may lead to the introduction of new methodologies or techniques. OR Success Stories, which describe demonstrably successful applications of operations research within the Southern African context (at the developing/developed economy interface) or similar environments elsewhere. OR Case Studies, which might not be "success stories", but which emphasize novel approaches or describe pitfalls in the application of operations research. 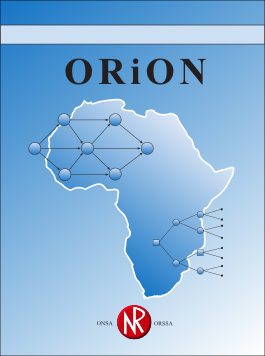 OR Methodological Reviews, which survey new and potentially useful methodological developments, aimed at operations research practitioners especially in Southern Africa.